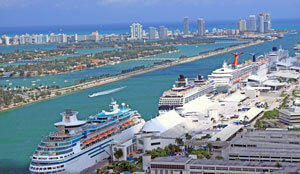 This is a list of cruise ships with scheduled Miami cruise departures. Some sail regularly from Miami, others only sail from Miami during certain parts of the year, and some aren’t currently sailing from Miami but are scheduled to do so in the future. Click on the ship name for more information about the ship and scheduled cruises from Miami. Divina, operated by Italian cruise line MSC, provides Caribbean cruises with a European flair. One of the smaller ships in the Royal Caribbean fleet, the Empress of the Seas offers a more relaxed, intimate cruising experience. The Enchantment of the Seas sails regular 3 and 4 night cruises to Bermuda, making it one of the prime options for quick vacation getaways. The Royal Caribbean Mariner of the Seas sails short three & four night cruises to the Bahamas from Miami, beginning in 2018. With Voyager-class amenities and a 2018 renovation, the Mariner is a great option for a quick weekend south Florida cruise. The Navigator of the Seas, refurbished in 2014, features a FlowRider surfing simulator, ice skating rink, and rock climbing wall, plus multiple specialty dining options and “Virtual Balconies” for inside cabins. The Symphony of the Seas, launching in 2018, is the world’s largest cruise ship. The Symphony will sail regular weekly cruises from Miami beginning in November of 2018. The Seven Seas Mariner is an all-suites ship. Each stateroom has a a private balcony, sitting area and walk-in closet. This elegant smaller ship, which underwent an extensive refurbishment in 2016, provides luxury cruises to a wide variety of port of call. Viking Sky is the third in Viking Cruises line of Ocean Ships. The ship has 465 cabins, all of which have private verandas. With a capacity of just 930 passengers, Viking Sky offers an intimate, small ship cruising experience. Viking Star holds the honor of being the first of Viking Cruises’ Ocean Ships. The ship has 465 cabins, all of which have private verandas. With a capacity of just 930 passengers, Viking Star offers an intimate, small ship cruising experience. Viking Sun is the fourth in Viking Cruises’ line of Ocean Ships. The ship has 465 cabins, all of which have private verandas. With a capacity of just 930 passengers, Viking Sun offers an intimate, small ship cruising experience.